Among the early Hebrews, as well as among many other nations of antiquity, custom decided that the next of kin should enter upon the possession of the estate of a deceased person. The first-born son usually assumed the headship of the family, and succeeded to the control of the family property (see Primogeniture). When there were no sons, the dying man would appoint a trusted friend as his heir, sometimes to the exclusion of a near relative. Thus, Abraham, when he despaired of having children himself, was about to appoint his slave Eliezer as his heir, although his nephew Lot was living (Gen. xv. 3). Even when there were children, it was within the right of the father to prefer one child to another in the disposition of his property. Sarah, not wishing Ishmael to share in the inheritance with her son Isaac, prevailed upon Abraham to drive Hagar and her son out of her house (Gen. xxi. 10); and Abraham later sent away his children by concubines, with presents, so that they should not interfere in the inheritance of Isaac (Gen. xxv. 6). Jacob, however, as it appears, made no distinction between the sons of his wives and those of his concubines (Gen. xlix. ), and included his grandsons Ephraim and Manassch among his heirs (Gen. xlviii. 5, 6). There could have been no question in those days of a widow inheriting from her husband, since she was regarded as part of the property which went over to the heirs, as is shown by the stories of Ruth, Absalom (II Sam. xvi. 21, 22), Adonijah, and Abishag (I Kings ii. 22; see Levirate Marriage). 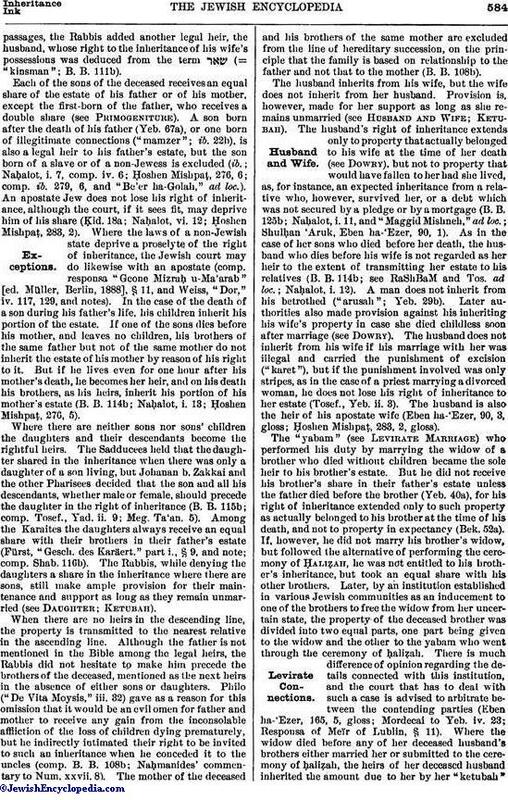 Nor could there have been a question about daughters inheriting from their father, since daughters were given in marriage either by their father, or by their brothers or other relatives after the father's death, thus becoming the property of the family into which they married (see Daughter in Jewish Law). An exceptional case is mentioned: Job gave his daughters a share in his estate equal to that of their brothers (Job xlii. 15). As a result of the question raised by the daughters of Zelophehad, the following general rules of inheritance were laid down by Moses: "If a man die, and have no son, then ye shall cause his inheritance to pass unto his daughter. And if he have no daughter, then ye shall give his inheritance unto his brethren. And if he have no brethren, then ye shall give his inheritance unto his father's brethren. And if his father have no brethren, then ye shall give his inheritance unto his kinsman that is next to him of his family, and he shall possess it" (Num. xxvii. 8-11). Brief though this law is, it allows sufficient latitude for legitimate interpretation by the phrase, "unto his kinsman that is next to him." According to this provision, there are four degrees of hereditary succession—that of the son, the daughter, the brother, and the father's brother. In the case of the daughter, it is stated that when she becomes the heir of her father's estate, she shall marry in her own clan (Num. xxxvi. 6, 7). This restriction was later repealed by the Rabbis (Ta'an. 30b; B. B. 120a). On the right of the first-born to a double share in the inheritance (Deut. xxi. 17) see Primogeniture. In accordance with the principles that he who comes first in the order of hereditary succession transmits that right to his descendants, and that the father comes before all his descendants in hereditary succession (B. B. 115a), the Rabbis elaborated the incomplete provisions of the Bible and established the following order of legal heirs: (1) sons and their descendants; (2) daughters and their descendants; (3) the father; (4) brothers and their descendants; (5) sisters and their descendants; (6) the father's father; (7) the father's brothers and their descendants; (8) the father's sisters and their descendants; (9) the father's father's father; and so on (Maimonides, "Yad," Naḥalot, i. 1-3; Shulḥan 'Aruk, Ḥoshen Mishpaṭ, 276, 1). To this list, which they regarded as implied in the Biblicalpassages, the Rabbis added another legal heir, the husband, whose right to the inheritance of his wife's possessions was deduced from the term (= "kinsman"; B. B. 111b). Each of the sons of the deceased receives an equal share of the estate of his father or of his mother, except the first-born of the father, who receives a double share (see Primogeniture). A son born after the death of his father (Yeb. 67a), or one born of illegitimate connections ("mamzer"; ib. 22b), is also a legal heir to his father's estate, but the son born of a slave or of a non-Jewess is excluded (ib. ; Naḥalot, i. 7, comp. iv. 6; Ḥoshen Mishpaṭ, 276, 6; comp. ib. 279, 6, and "Be'er ha-Golah," ad loc.). An apostate Jew does not lose his right of inheritance, although the court , if it sees fit, may deprive him of his share (Ḳid. 18a; Naḥalot, vi. 12; Ḥoshen Mishpaṭ, 283, 2). Where the laws of a non-Jewish state deprive a proselyte of the right of inheritance, the Jewish court may do likewise with an apostate (comp. responsa "Geone Mizraḥ u-Ma'arab" [ed. Müller, Berlin, 1888], § 11, and Weiss, "Dor," iv. 117, 129, and notes). In the case of the death of a son during his father's life, his children inherit his portion of the estate. If one of the sons dies before his mother, and leaves no children, his brothers of the same father but not of the same mother do not inherit the estate of his mother by reason of his right to it. But if he lives even for one hour after his mother's death, he becomes her heir, and on his death his brothers, as his heirs, inherit his portion of his mother's estate (B. B. 114b; Naḥalot, i. 13; Ḥoshen Mishpaṭ, 276, 5). Where there are neither sons nor sons' children the daughters and their descendants become the rightful heirs. The Sadducees held that the daughter shared in the inheritance when there was only a daughter of a son living, but Johanan b. Zakkai and the other Pharisees decided that the son and all his descendants, whether male or female, should precede the daughter in the right of inheritance (B. B. 115b; comp. Tosef., Yad. ii. 9; Meg. Ta'an. 5). Among the Karaites the daughters always receive an equal share with their brothers in their father's estate (Fürst, "Gesch. des Karäert." part i., § 9, and note; comp. Shab. 116b). The Rabbis, while denying the daughters a share in the inheritance where there are sons, still make ample provision for their maintenance and support as long as they remain unmarried (see Daughter; Ketubah). When there are no heirs in the descending line, the property is transmitted to the nearest relative in the ascending line. Although the father is not mentioned in the Bible among the legal heirs, the Rabbis did not hesitate to make him precede the brothers of the deceased, mentioned as the next heirs in the absence of either sons or daughters. Philo ("De Vita Moysis," iii. 32) gave as a reason for this omission that it would be an evil omen for father and mother to receive any gain from the inconsolable affliction of the loss of children dying prematurely, but he indirectly intimated their right to be invited to such an inheritance when he conceded it to the uncles (comp. B. B. 108b; Naḥmanides' commentary to Num. xxvii. 8). The mother of the deceased and his brothers of the same mother are excluded from the line of hereditary succession, on the principle that the family is based on relationship to the father and not that to the mother (B. B. 108b). The husband inherits from his wife, but the wife does not inherit from her husband. Provision is, however, made for her support as long as she remains unmarried (see Husband and Wife; Ketubah). 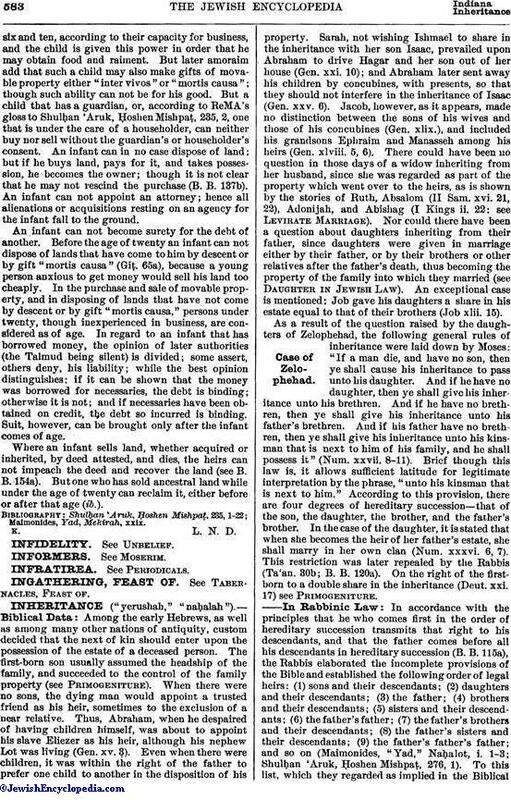 The husband's right of inheritance extends only to property that actually belonged to his wife at the time of her death (see Dowry), but not to property that would have fallen to her had she lived, as, for instance, an expected inheritance from a relative who, however, survived her, or a debt which was not secured by a pledge or by a mortgage (B. B. 125b; Naḥalot, i. 11, and "Maggid Mishneh," ad loc. ; Shulḥan 'Aruk, Eben ha-'Ezer, 90, 1). As in the case of her sons who died before her death, the husband who dies before his wife is not regarded as her heir to the extent of transmitting her estate to his relatives (B. B. 114b; see RaShBaM and Tos. ad loc. ; Naḥalot, i. 12). A man does not inherit from his betrothed ("arusah"; Yeb. 29b). Later authorities also made provision against his inheriting his wife's property in case she died childless soon after marriage (see Dowry). The husband does not inherit from his wife if his marriage with her was illegal and carried the punishment of excision ("karet"), but if the punishment involved was only stripes, as in the case of a priest marrying a divorced woman, he does not lose his right of inheritance to her estate (Tosef., Yeb. ii. 3). The husband is also the heir of his apostate wife (Eben ha-'Ezer, 90, 3, gloss; Ḥoshen Mishpaṭ, 283, 2, gloss). The "yabam" (see Levirate Marriage) who performed his duty by marrying the widow of a brother who died without children became the sole heir to his brother's estate. But he did not receive his brother's share in their father's estate unless the father died before the brother (Yeb. 40a), for his right of inheritance extended only to such property as actually belonged to his brother at the time of his death, and not to property in expectancy (Bek. 52a). If, however, he did not marry his brother's widow, but followed the alternative of performing the ceremony of ḤaliẒah, he was not entitled to his brother's inheritance, but took an equal share with his other brothers. Later, by an institution established in various Jewish communities as an inducement to one of the brothers to free the widow from her uncertain state, the property of the deceased brother was dividedinto two equal parts, one part being given to the widow and the other to the yabam who went through the ceremony of ḥaliẓah. There is much difference of opinion regarding the details connected with this institution, and the court that has to deal with such a case is advised to arbitrate between the contending parties (Eben ha-'Ezer, 165, 5, gloss; Mordecai to Yeb. iv. 23; Responsa of Meïr of Lublin, § 11). Where the widow died before any of her deceased husband's brothers either married her or submitted to the ceremony of ḥaliẓah, the heirs of her deceased husband inherited the amount due to her by her "ketubah"(marriage contract) and one-half of the dowry given (at marriage) to her by her father or his heirs ("nikse ḥon barzel"; see Dowry), while the rest of her property went to her family (Ket. 80a; Naḥalot, iii. 9; Eben ha-'Ezer, 160, 7; comp. Nissim Gerondi, Responsa, §§ 46, 54). Mere presumption is sufficient to establish the identity of an heir (see ḤazaḲah). If two witnesses testify that a man is known as the son of the deceased, though they can not trace the genealogy of the family, the man so known is regarded as the legal heir (Naḥalot, iv. 7; Ḥoshen Mishpaṭ, 280, 1). If, however, the deceased said before death that the claimant was not his son, the latter, although the presumption is in his favor, can not claim a portion in the inheritance. The testimony of the deceased is valid only when it relates to a son, but not when it relates to a brother or to another relative (B. B. 134a). 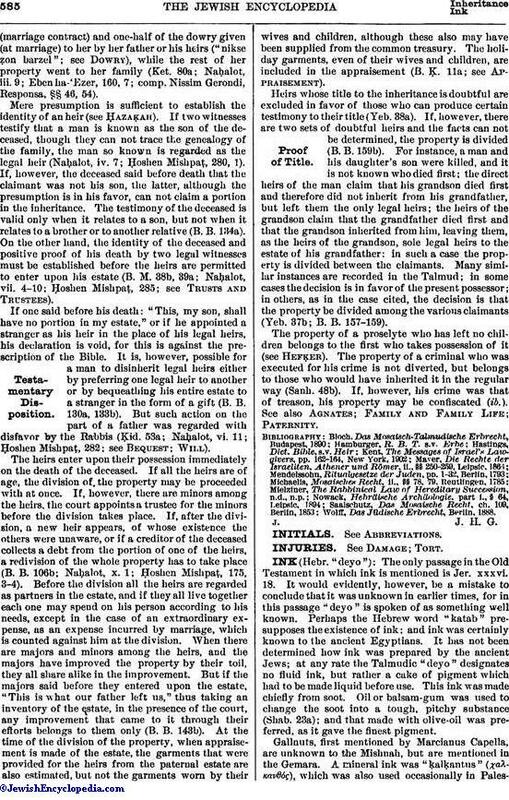 On the other hand, the identity of the deceased and positive proof of his death by two legal witnesses must be established before the heirs are permitted to enter upon his estate (B. M. 38b, 39a; Naḥalot, vii. 4-10; Ḥoshen Mishpaṭ, 285; see Trusta and Trustees). If one said before his death: "This, my son, shall have no portion in my estate," or if he appointed a stranger as his heir in the place of his legal heirs, his declaration is void, for this is against the prescription of the Bible. It is, however, possible for a man to disinherit legal heirs either by preferring one legal heir to another or by bequeathing his entire estate to a stranger in the form of a gift (B. B. 130a, 133b). But such action on the part of a father was regarded with disfavor by the Rabbis (Ḳid. 53a; Naḥalot, vi. 11; Ḥoshen Mishpaṭ, 282; see Bequest; Will). The heirs enter upon their possession immediately on the death of the deceased. If all the heirs are of age, the division of the property may be proceeded with at once. If, however, there are minors among the heirs, the court appoints a trustee for the minors before the division takes place. If, after the division, a new heir appears, of whose existence the others were unaware, or if a creditor of the deceased collects a debt from the portion of one of the heirs, a redivision of the whole property has to take place (B. B. 106b; Naḥalot, x. 1; Ḥoshen Mishpaṭ, 175, 3-4). Before the division all the heirs are regarded as partners in the estate, and if they all live together each one may spend on his person according to his needs, except in the case of an extraordinary expense, as an expense incurred by marriage, which is counted against him at the division. When there are majors and minors among the heirs, and the majors have improved the property by their toil, they all share alike in the improvement. But if the majors said before they entered upon the estate, "This is what our father left us," thus taking an inventory of the estate, in the presence of the court, any improvement that came to it through their efforts belongs to them only (B. B. 143b). At the time of the division of the property, when appraisement is made of the estate, the garments that were provided for the heirs from the paternal estate are also estimated, but not the garments worn by their wives and children, although these also may have been supplied from the common treasury. The holiday garments, even of their wives and children, are included in the appraisement (B. Ḳ. 11a; see Appraisement). Heirs whose title to the inheritance is doubtful are excluded in favor of those who can produce certain testimony to their title (Yeb. 38a). If, however, there are two sets of doubtful heirs and the facts can not be determined, the property is divided (B. B. 159b). For instance, a man and his daughter's son were killed, and it is not known who died first; the direct heirs of the man claim that his grandson died first and therefore did not inherit from his grandfather, but left them the only legal heirs; the heirs of the grandson claim that the grandfather died first and that the grandson inherited from him, leaving them, as the heirs of the grandson, sole legal heirs to the estate of his grandfather: in such a case the property is divided between the claimants. Many similar instances are recorded in the Talmud; in some cases the decision is in favor of the present possessor; in others, as in the case cited, the decision is that the property be divided among the various claimants (Yeb. 37b; B. B. 157-159). The property of a proselyte who has left no children belongs to the first who takes possession of it (see HefḲer). The property of a criminal who was executed for his crime is not diverted, but belongs to those who would have inherited it in the regular way (Sanh. 48b). If, however, his crime was that of treason, his property may be confiscated (ib.). See also Agnates; Family and Family Life; Paternity. Wolff, Das Jüdische Erbrecht, Berlin, 1888.